These days hair loss in women is as a big problem and their are many causes for hair loss. 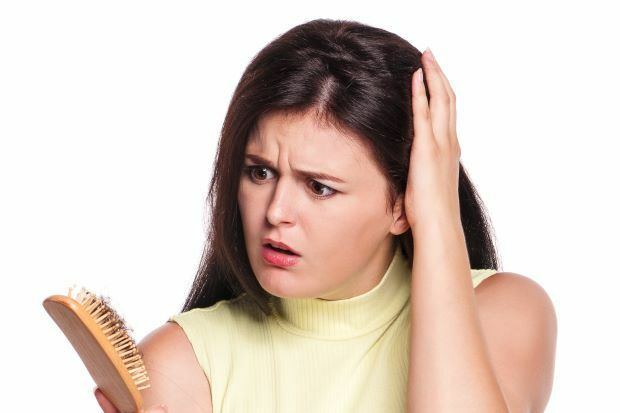 Unfortunately women are also more likely to lose their thick and lustrous hair than men, mostly due to crash dieting, chemical treatments, vitamin deficiency, health problems, and overexposure to the Sun. Losing your hair as a woman, especially if you’re young, can be an awful experience. If you feel like you’re losing your thick and bouncy hair, then you are not alone. Hair loss in women is on the rise all across the world. There are countless women who lose a lot of hair during and after pregnancy. During the first four weeks of pregnancy, many women begin to notice heavy hair loss. Hair has a life cycle – it grows, then rests, and then falls out. But during pregnancy the hair life cycle changes entirely. When there is an imbalance in the “estrogen” hormone of the body, the increased number of your hair goes into the “telogen” resting stage and eventually falls out. To keep your hair strong, shiny, and thick during pregnancy, eat a well-balanced diet that is high in proteins, vitamins, calcium, and more. When a person is under heavy stress, he or she may notice many physical symptoms – headaches, depression, stomach cramps, etc. These physical symptoms can disrupt hormone levels in a human body and trigger telogen effluvium hair loss. People who go on crash diets or who have abnormal eating habits may face protein deficiency. This deficiency can lead to hair loss or to brittle hair. Anemia is commonly caused by iron deficiency, which is one of the most important minerals for your hair. At present, one in ten women suffers from anemia due to iron deficiency. Therefore, it’s vital to get a well-balanced food that is rich in iron. This gland secretes hormones that are vital to metabolism as well as overall growth of your body. In case, if it stops secreting enough hormones, you will face hair loss. Extreme styling and hair treatments can cause your hair fall out. Avoid head items, harsh chemicals, and tight braids in order to keep your hair in a better condition. Dealing with dull, brittle, and rough hair? Take a look at what you’re putting on your plate. There’s a strong bond between your overall nutrition and the state of your hair locks. Make sure, you’re eating a well-balanced food. Walnuts: These are incredibly hair-friendly. No only do they have more omega-6 fatty acids, but they’re also full of Zinc, Iron, Vitamin B1, and plenty of protein. They provide your hair the nutrients it needs to support optimal hair growth. Beans, Spinach, Chickpeas, and Lentils: Studies have shown that severe protein deficiency can lead to unhealthy hair or hair loss and thinning. These plant foods increase the thickness of your hair and encourage the growth of your hair. Salmon: Struggling with your bad hair? Salmon is full of omega-3 fatty acids that feed your hair follicles, helping lubricate hair for added luster. Pumpkin Seeds: One ounce of roasted pumpkin seeds supplies 20% of your daily requirements of minerals. These pumpkin seeds help prevent scalp dryness and increase the overall growth of your hair. If you don’t have time to make sure you fit all of those foods into your diet then using supplements is a great thing to do to help make your hair grow. Aviva’s supplements provide essential nutrients (Folic acid, Vitamin B5, Zinc, Iodine, Iron, Chromium, Biotin, Boron, Selenium, and more.) that your hair needs to grow long and thick. Our supplements are clinically proven to enhance the growth, thickness, volume and softness of your hair. Consuming our natural supplements along with your regular diet can reduce the risk of hair loss. Try Aviva today!